More Ways to Connect to Your Libraries’ Resources! We hope you had a pleasant Fall Break! As the semester progresses, we continue to offer additional ways to connect students and faculty to our resources. The University Libraries has arranged for a trial of BrowZine, a new app for mobile devices, until November 21, 2014. 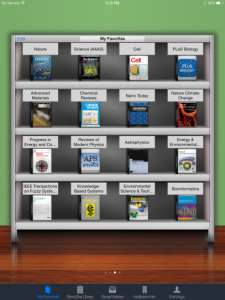 BrowZine allows users to access our paid electronic periodical content through their mobile devices in a display that emulates physical bookshelves. From your iPad, iPhone (please note that BrowZine works best on iPad 2 or later), or Android device, download BrowZine from the App Store, Google Play, or Kindle/Amazon store and install it. When you open BrowZine for the first time, you will see a list of schools. Select the University of Memphis, then enter your user ID and password (same as for other University Libraries’ resources). Choose the subject areas and start browsing! Don’t forget to let us know what you think of BrowZine by leaving a comment on the blog or e-mailing Cody Behles at cbehles@memphis.edu. For help finding subject-specific resources, you can explore our collection of customized online research guides. Themes of recent guides include Network Science, the Sociology of Gender, and Tiger Blue Goes Green: Sustainability. The next time you’re in McWherter Library, be sure to browse our two New Additions bookcases located on either side of the Circulation desk. Acquired titles are also posted on our Pinterest page and often highlighted on Twitter and Facebook. Research question? Keep calm and ask a librarian! 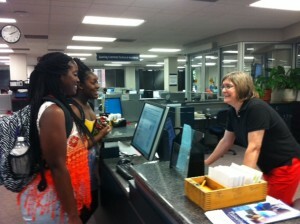 Whether you are working at home or on-campus, the University Libraries’ staff is happy to help with your research. Visit our Ask a Librarian page for a list of FAQs and multiple ways to contact us including text, chat, and e-mail; there’s even a form you can submit if you’re having technical difficulties with the Libraries’ online resources. For writing help, please make an appointment with the Center for Writing and Communication located near the reference desk on the first floor of McWherter Library. Passport is a tool which allows users the ability to identify a consumer market, see all of the players in that market, and understand all relevant consumer dynamics of that market. It covers consumer products and services in 80 countries and has over 100 million exportable statistics and 18,000 regularly updated qualitative reports on industries, companies, countries, and consumers. 85% of Fortune 500 companies use data and analysis from Passport for strategic marketing decisions. The trial access runs through February 28, 2014.